This is not a mountain biking post about riding tree roots. This is more about why I ride, where did it all start? 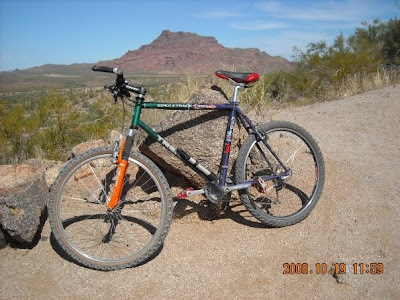 I first rode a mountain bike back in 1994 thanks in part to my friend, Adam, who let me borrow a rigid 26" for my 'off-road' ride at Papago Park. I was hooked immediately. I have always enjoyed the freedom bike riding brought to me. 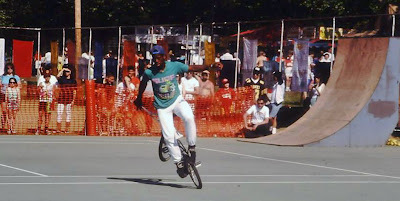 Back in 1994 I was beginning to taper off my BMX freestyle flatland ways & looking to find something to keep me in shape during the skiing off season. Enter mountain biking. 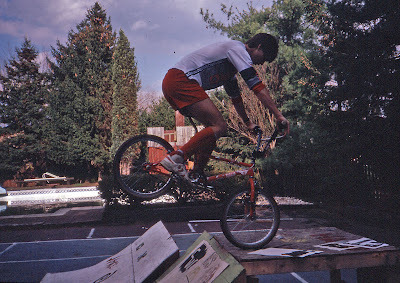 I should have known I'd enjoy the sport, afterall my riding obsession began in earnest way back in the summer of 1986. 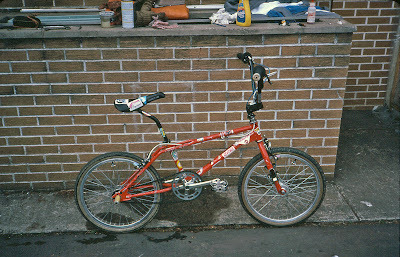 Growing up in Allentown, PA I never really had a BMX bike as a kid, it was usually a 10 speed or some banana seat Huffy. 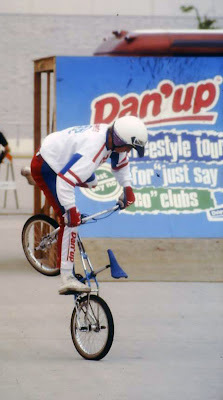 One day I modified the Huffy into a pseudo BMX bike to be one of the cool kids. A couple of neighborhood kids and I went down to our local 7-Eleven where, right next door, was a dirt lot with jumps. We'd often mess around there for hours, grab a slurpee and head home. 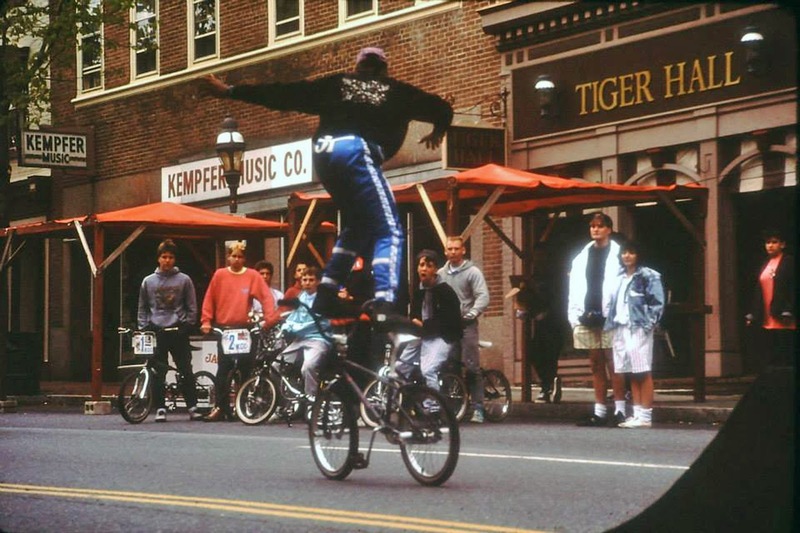 One day that summer we met a group of older kids from nearby on these tricked out freestyle bikes, it was awesome! They were doing all kinds of tricks/stunts that I had never seen before. I wanted to learn how to do that, but I knew my Huffy wasn't the bike. So, I finally got my mom to agree to let me buy a 'real' BMX bike. A few weeks later my friend, Paul, happened to be selling his old Kuwahara BMX bike. I snagged it up and was so excited to finally have a bike worthy of taking to the local jumps. The next day Paul and I rode down to Dorney Park & Wild Water Kingdom for a day at the water park. We locked our bikes, he had an SE Quadangle, to a tree and went inside. That afternoon we came out of the park and both bikes were GONE! Not even 24 hours in my possession and my Kuwahara was stolen. I was crushed. Paul had insurance on his bike, but mine really wasn't worth that much. Only to me. My mom felt really bad and the next day we went down to the local bike shop and I picked out a shiny new Haro FST freestyle bike with one caveat: I pay for everything going forward. 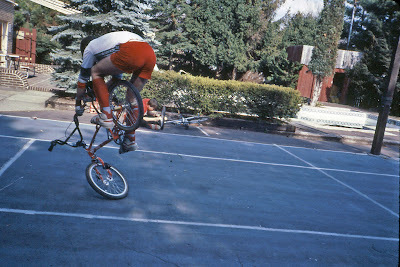 Now, not only did I have a new bike for the dirt jumps, but I could now learn how to do those tricks we saw at 7-Eleven. 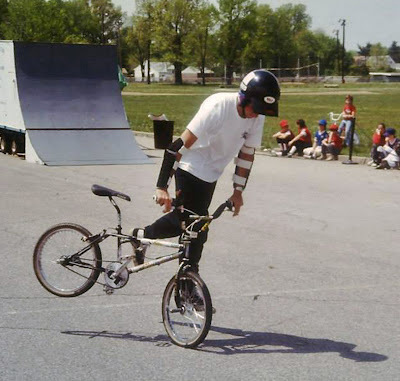 This was the start of my flatland freestyle days. One of my earliest pics, note the Halley's Comet T-shirt!! My Haro FST with Skyway Tuff Wheels. A few of the kids in the neighborhood also bought freestyle bikes around the same time. We were always out messin' around trying to learn new tricks. 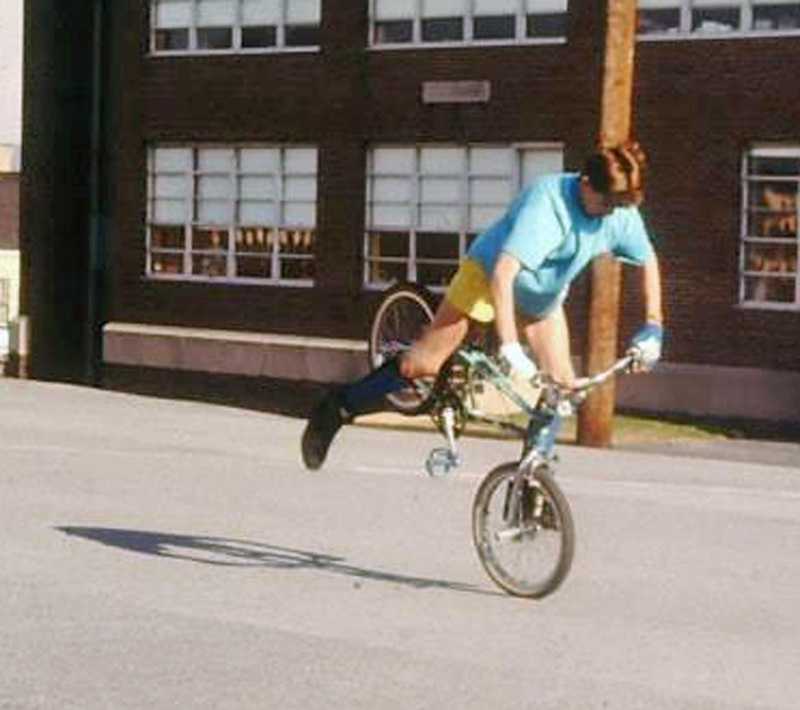 Endos, framestands, riding backwards, pogo's, they were all the norm back then. One of the locals, Travis, lived a couple blocks down the street and he was getting pretty good at flatlanding as well. We would end up riding together most of the time pushing each other to get better. Paul never really got into the sport, but he introduced me to a couple of his riding friends, Chris & Kevin. 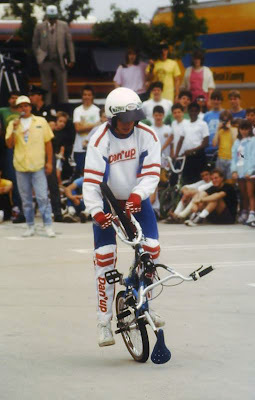 They were both primarily ramp (quarterpipe / halfpipe) riders, but were also better flatland riders than Travis and I. It was cool to hang around kids from other area schools who were better, they helped me push my limits higher. Chris lived on the other side of South Mountain (yes, there's a South Mountain in PA too!) with a large yard. We'd eventually build a halfpipe in his yard. Kevin lived out in the farmland borderlands, but had one of the coolest backyards ever. Sloped hill with a plywood runway to a quarterpipe, some launch ramps & other 'street' features we could ride. It was an early days skate park for bikes. I wish I had more photos from these days. Good times, good friends & bikes. We had plenty of good local area 'ride spots' to choose from. 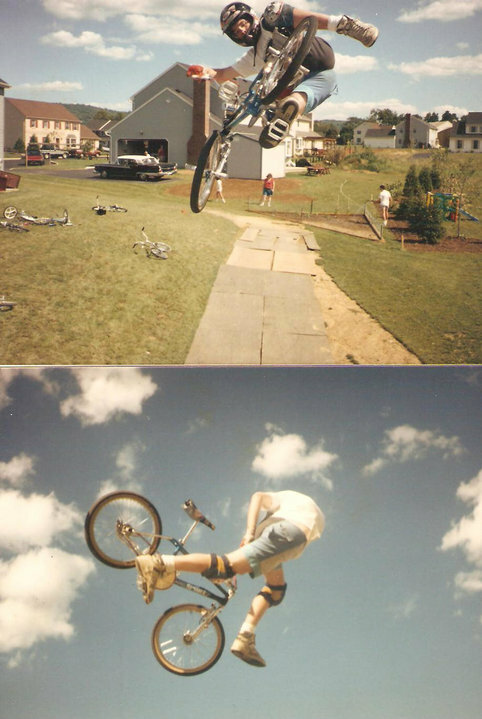 Travis and I mostly rode down at our elementary school, tons of smooth blacktop & a really nice dirt jump. The AMC theatre had a really nice lighted parking lot, Allen High with its covered parking garage, Union Terrace (UT) had a cool paved embankment, there were the dirt jumps at Tioga St & Posh track, The Wall & smooth dirt jump over in Bethlehem, just a ton of cool places to ride and hang out. Early pic, 1987?? Bar endo, riding in my backyard. A hastily slapped together kick-turn ramp. 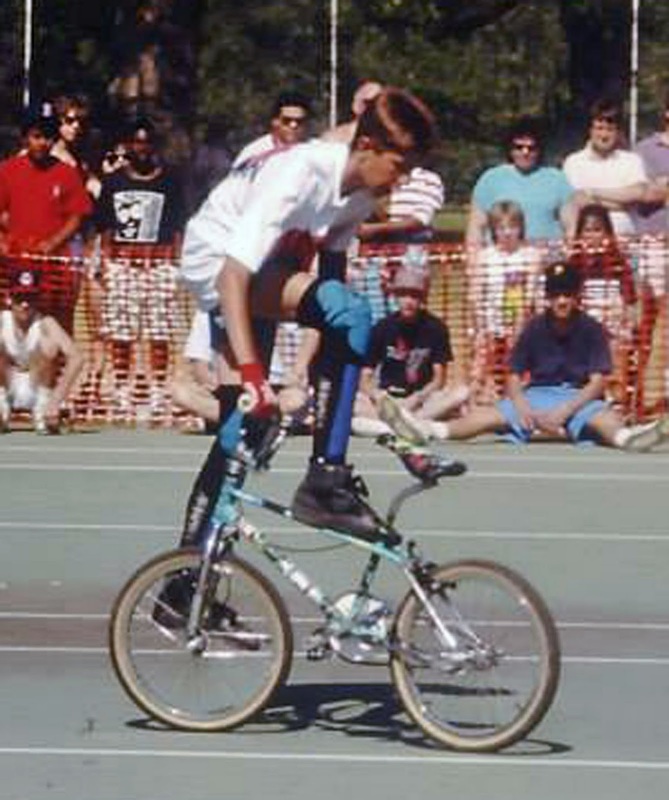 Travis squeaking across a cold intersection on his Haro Master. He STILL has that bike, sans paint. One of the few tricks I can still do!! Tons of room to roam at Cetronia Elementary school. Had to ride brakeless for a bit after I broke a frame. It had to be cold if I was wearing jeans & thick gloves. 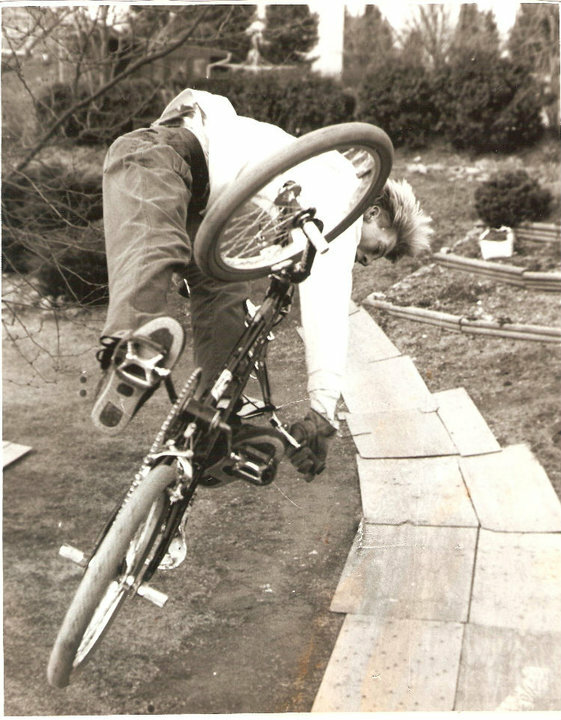 Taken in Emmaus, PA.
Travis after he ditched the mag wheels in favor of spokes. Travis built a much nicer ramp after we ran mine into the ground. On occasion a tour would roll through our area, we were always eager to check out the pro riders, get stoked and try to learn new tricks. One of the first shows we went to was a Haro show up in Scranton, PA. It was our first time seeing the pics in magazines come to life, it was RAD!! Haro freestyle tour brought to you by Dan'up!! Remember that stuff?? Eddie Fiola blasting a huge air at the GT show. Back in the pre-internet days, there was no Youtube, we gathered our riding stoke from magazines and VHS videos. One set of videos in particular caught our attention, they were produced by a group of kids over in York, PA and they called themselves the Plywood Hoods. They put out a series of videos over a few years dubbed Dorkin' in York. These gents were leading the way in flatland freestyle with innovation and difficulty well beyond the current scene of the day. We'd watch the videos over & over, in slo-mo & still couldn't figure out how they did what they did. It sure made us want to ride though! 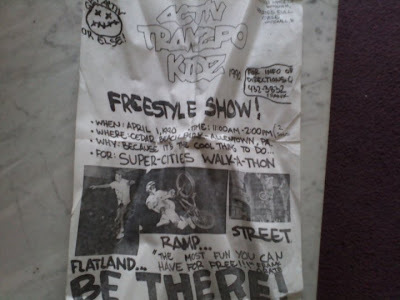 I believe it was the summer of '88 and a GT/Dyno show was coming to town. We arrived early to get a good spot for viewing the ramp action. The show went on like normal with the riders pumping up the crowd. When it was all over we hung out and started talking to the riders & tour manager. Eventually we talked them into altering their travel plans to come hang out with us over at Kevin's backyard bikepark!! How cool is that? Hanging out with a professional team in your buddy's backyard!! This was going to be awesome. We loaded our 4 bikes into my Dad's station wagon, 2 in & 2 on the back. The GT tour van following close behind. It had just started to rain as we were crossing the Lehigh River headed towards downtown Allentown when a few cars in front of us started banging into each other!! Crap! I slammed on the brakes and came within inches of hitting the now sideways car in front of us. I remember looking over to Kevin and saying 'Whoa, that was close! ', then BOOM!! The GT tour van slammed into the back of the station wagon and pushed us into the car in front. We were all ok, but a bit rattled. I was 17, driving my Dad's car and just had my first accident!! There was hardly a scratch on the GT van, but both Kevin & Chris' bikes were mangled. What a way for that day to end. Crunched car & bikes, that's GT pro rider Dave Voelker in the background! Later that summer Kevin's dad took a bunch of us a freestyle road trip of sorts. We even had t-shirts printed up!! The Scrounge Tour was born! 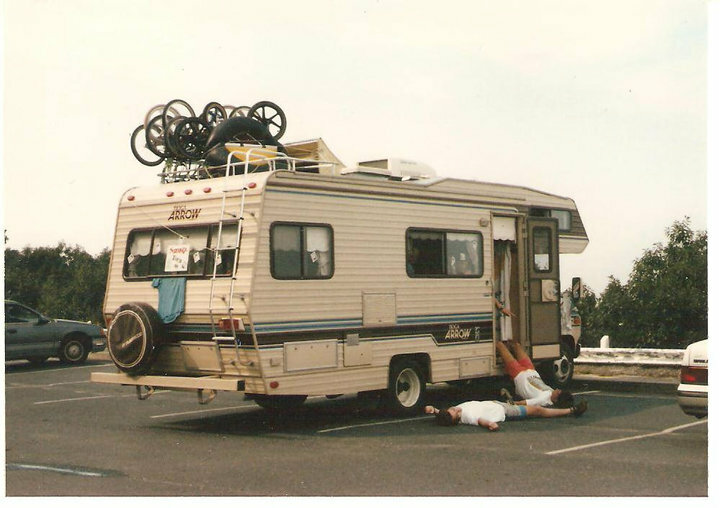 We crammed all our bikes, a launch ramp and camping gear into a RV and had a great time lake jumping, flatland riding, doing impromptu shows in the Six Flags parking lot, jet skiing and ended it with a full weekend in Wayne, NJ watching the American Freestyle Assn. (AFA) Masters Series contest. Scrounge Tour at a rest stop in New Jersey. Kevin's dad was always on board with the riding scene. 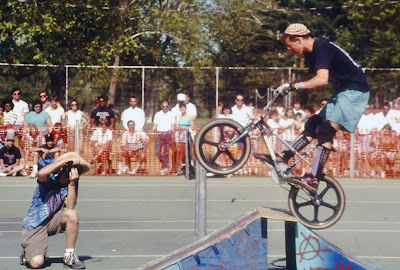 He eventually would book us to do local shows and picked up a full 8' quarter pipe to tow around so Chris & Kev could show off their high flying skills. 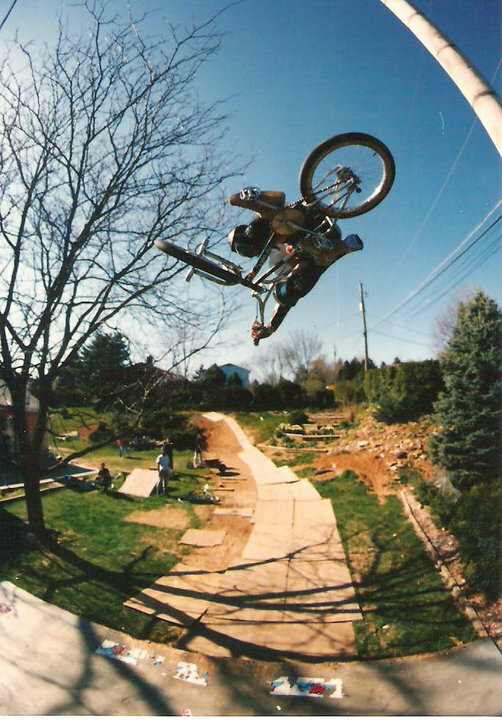 Kevin blasting a huge air in his backyard. Chirs with his signature move: turndown. 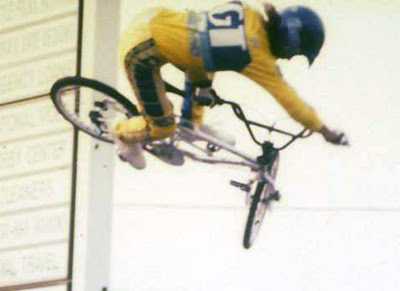 I was 15 when I started riding flatland, didn't get my driver's license until I was almost 17, just didn't feel the need. I had my bike. When I finally did start driving, I was more excited about the riding opportunities it opened up! Now we could drive out to the Reading skate park - we had to go a few hours before it opened because at first there was a 'no bike' policy, so we'd hop the fence for a couple hours then leave!! There always seemed to be some kind of jam session or contest going on in the area. While I only entered two contests, it was fun to just hang out and soak it all up. As we progressed and attended more shows/contests we would meet other area riders. We'd eventually cross paths with the kids from 7-Eleven. They were known as the Activ Tranzpo Kidz (ATK) and eventually Kevin, Chris, Travis and myself would end up riding with those guys. They had some riders come & go, but Mel, Erik, John (Luc-e) & Frank were the mainstays and all really good. We'd even put on shows at the local spring fair, Mayfair, in Allentown.. Designed by one of the early members, Mike Ireton. One of our show flyers. Frank catching some air during the Mayfair show. 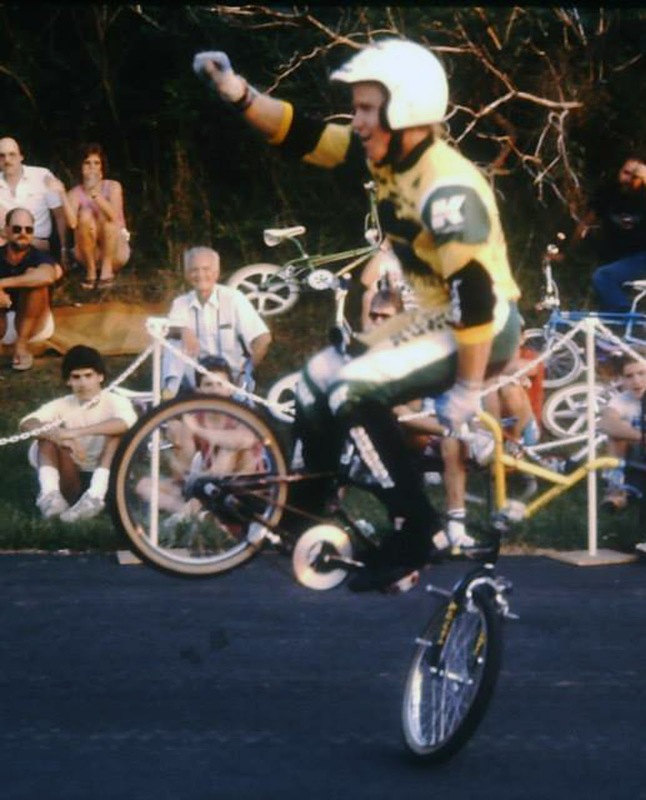 Mel was our premiere flatland rider. Trav was the youngest of the bunch, but could ride with anyone. Erik getting some practice time in. One of my more consistent tricks, a Backyard. The shows were fun, the contests I entered were nerve wracking, but that's not why we rode. I rode for the challenge of learning a difficult trick, the freedom of being outside with my friends pushing one another to get better. It wasn't uncommon for us to be out riding 10+ hours at a time on weekends or a few hours at night during the week. A couple of the guys were always around, never a shortage of ride partners & good times. 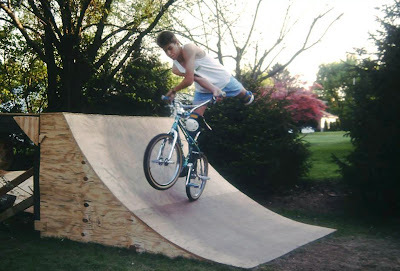 I wasn't much of a ramp rider even though I had this nice quarter pipe. Instead I rode flatland endlessly out in our cul-de-sac. Kevin had to get creative when he came over to ride the ramp! Kevin getting the biggest air my ramp ever saw! Mel could arguably do the best 'no-footer' I've ever seen! Luc-e practicing a tail-ship air at the Cetronia jump. Fun times down at the Allen High garage: Mel, Kevin, Erik, Chris & Trav. Mel surfing for the onlookers. Chirs blasting a turndown on the Woodward ramps. Chris showing his lip skills! One of the few pics of me during an actual contest run, thanks Trav for digging this one up! You deserved a trophy on this day more than I did. Luc-e soaring a tail-whip over a set of doubles at one of our favorite dirt jumping spots: Tioga St.
Chris at the Union Terrace jam. As I got older I started looking into colleges and ended up traveling west to Arizona State. During my last summer in PA, Erik and I sat down one rainy weekend and poured over all our video footage we had accumulated. We spliced clips and dubbed a soundtrack and The Video was born. It ended up being a 45 minute highlight reel of our riding days. I still have a VHS copy and finally digitized it a couple years ago. One of my projects is to turn it into a DVD so it'll last a bit longer. I still kept in touch with a few of the guys, mostly Trav & Erik. I ended up riding solo a good deal of the time at ASU, but I stayed interested in flatland for a couple more years. One of my first pictures at ASU. Along the Scottsdale greenbelt near Camelback Rd. The Wedge in Scottsdale was a popular place to practice tricks like a grip ride. Over in Glendale there was a biker friendly skatepark, Thrasherland with a giant fiberglass snake run! During my freshman year, my roommate and I went for a nice ride. He was on a road bike, I was on my freestyle bike. We left campus early one Sunday morning arriving at South Mountain Park a couple hours later. We then rode up to the summit & by shear dumb luck the road was closed to motorized traffic that day for a charity bicycle event. We must have been near the tail end, but the aid stations were still handing out water, so we took advantage since neither one of us carried any! I made the summit without stopping on my 44x16 geared flatland machine and to our surprise we were handed a hotdog & coke in the finish area!! We flew down the road and made our way back to ASU after cruising through downtown Phoenix. I'm guessing we rode around 40 miles that day, not something I'd recommend on a 20" bike!! It sure was fun though. 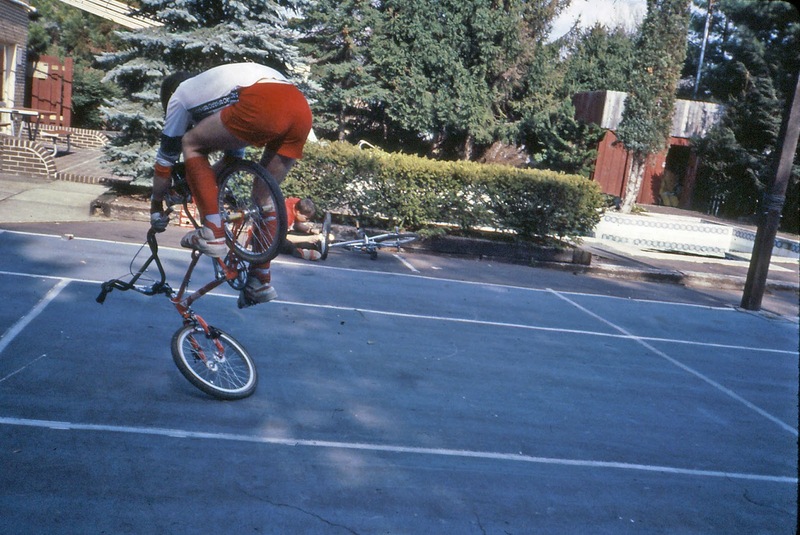 By 1994 I had tapered off my flatland riding considerably. I had heard there was a big contest happening over in Moreno Valley, CA and Mel & Luc-e were driving across the country to enter. I figured I go over to check it out & root on the fellas. They didn't disappoint. 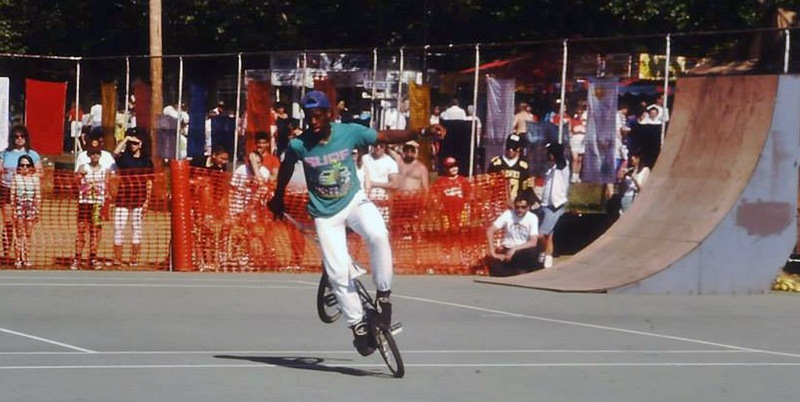 Mel during his contest run. Shortly after the Moreno Valley contest Adam took me to Papago Park for that now infamous first mountain bike ride. I haven't looked back. On a side note, sometime in the late 90's I was up in Flagstaff and stopped into one of the outdoor stores. On my way out I passed by a large magazine rack and an issue of BMX Plus! caught my attention. I thought to myself that I hadn't picked one of those up in years. As I thumbed threw it I was surprised to see Chris' name in a bunch of the photo credits, Mel & Luc-e were both pictured in the mag as sponsored riders for one of the bike companies. Now that was RAD! I ended up tracking Chris down via email, he was the art director at Camp Woodward. Here's a chronological list of the bikes I rode during my flatland years, only the ones that I spent significant time on are shown. GT Pro Freestyle Tour. 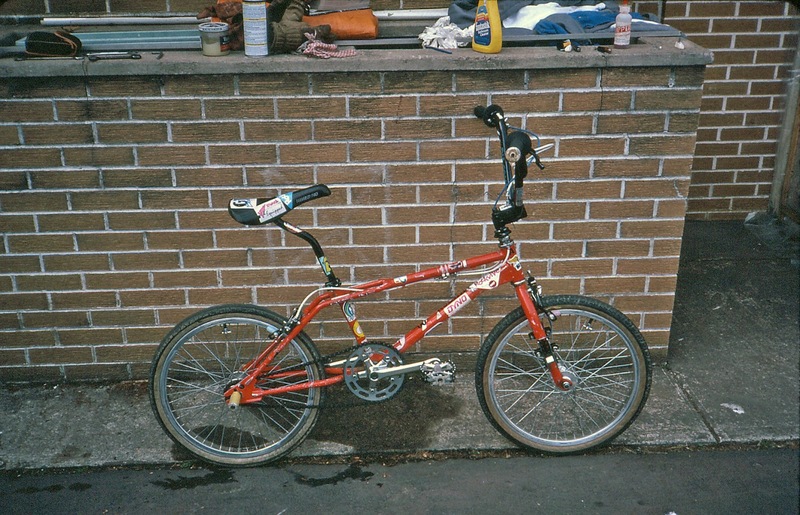 I still have this bike. I've only had three mountain bikes so far, but I'm itching to expand my stable as funds permit. Jamis Dakar ('09-'12). This frame was broken when given to me. I had a buddy weld it and it held strong for years! Loaded with bikepacking gear (prior to the AZT300). In short, I love to ride, always have. Great read, brought back a lot of memories. My self and 2-3 other friends rode allentown all the time ( from whitehall ) rode plenty of times running in to mel and the atk guys and just rip up atown for a few hours. Thanks for the memories. Thank you! I wonder if we ever crossed paths? I haven't seen Mel since '94!! Oh man, that was a great read! I never BMX'd freestyle, etc., I was a straight trail rider and downhiller, but I started in 1982, so all of those photos bring back a lot of memories, just of the times. We wore skid lids and Protec buckets, with soccer pads. A bunch of my friends did bicycle trials, I eventually raced. Thanks for such a great blog and wonderful photos! Riding is riding, eh? My first set of shin guards were the soccer variety. Thanks for checking it out. Ride on!! Great story/history John! It all brought back a lot of great memories. I love that Mel and Luc-e stayed with it and got sponsored! The moment you picked up that BMX mag and saw them it had to close a huge loop for you. Also your Flag to GC trip inspires me to go get after it!!! Thanks for sharing your life!!! Dang, I just now saw this commment!! Thanks Ryden, those were some fun years.